Cover up? 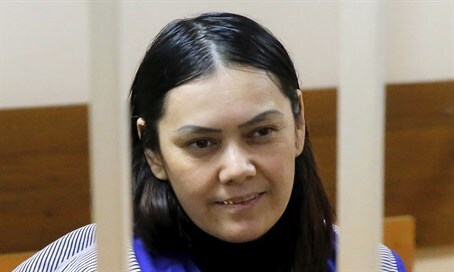 Russian authorities play down claims by 'bloody nanny' that she killed to avenge Syria campaign, insist she is mentally ill.
(AFP) Moscow investigators said Thursday that a nanny accused of decapitating a child has been diagnosed schizophrenic, as footage emerged of her apparently linking the killing to Russia's bombing in Syria. Suspect Gyulchekhra Bobokulova from Muslim-majority Uzbekistan - whom the press have dubbed "the bloody nanny" - was detained on Monday as she was waving the child's severed head outside a metro station in northwestern Moscow. She was sent for psychiatric examinations. Arriving at a Moscow court on Wednesday, the 38-year-old told journalists that "Allah ordered" the killing as a judge ordered her held in custody for two months over the murder of the girl, whom investigators say was aged either four or five. Undated footage later emerged on the Internet appearing to show the mother-of-three saying the attack was "revenge" for Russian President Vladimir Putin's bombing campaign in Syria, which began in September. "I took revenge," she says in the video in response to a question from a man who cannot be seen. "Against the one that spilled blood," she says, dressed in the same clothes she wore in court. "Putin is bombing. Bombs from airplanes. Why are you bombing Muslim? Nobody talks about it. They also want to live." After the appearance of the video, Russia's Investigative Committee - which reports directly to Putin - swiftly released a statement saying Bobokulova has "long been diagnosed with schizophrenia". "For a person who has long been diagnosed with schizophrenia, the motive at the moment the crime was committed, as a rule, does not coincide with the explanations given after the event," committee spokesman Vladimir Markin said. "I appeal to the media: do not make premature conclusions and protect the psychological state of your viewers." Kremlin spokesman Dmitry Peskov also dismissed Bobokulova's apparent claims that the killing was revenge for Putin's Syria campaign. "It is obvious that we are talking about a deranged person," Peskov said. "You need to relate to her words as you would to the words of a deranged person." Bobokulova is suspected of butchering the girl at the family's apartment in northwestern Moscow, before torching it and fleeing the scene. Witnesses reported seeing an agitated woman dressed in black who threatened to "blow everyone up," with some media reports saying she shouted "Allahu Akbar" - Arabic for "God is greatest" - as she paced up and down with the child's head outside a metro station. Russia's national television channels have almost entirely ignored the brutal slaying of the child Nastya, who suffered from epilepsy and learning disabilities. The Kremlin has defended the blackout while rejecting claims it ordered the move, with Peskov saying the subject was "probably too monstrous to be shown on television".